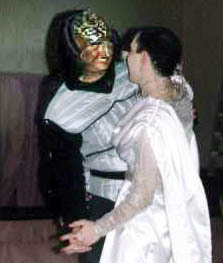 This Klingon picture was taken by Julia Jones and the mutoid picture by Mark Withall. Fiona Scarlett very kindly made the mutoid outfit for me. There are more of Julia's pix from Redemption as well as other pictures and reports of the convention at Judith Proctor's web site, which also covers general Blake's 7 stuff. You can also find a report and pictures on Louise and Simon's web site. And some of Jem Ward's pictures from Redemption can be found on the convention pictures page. 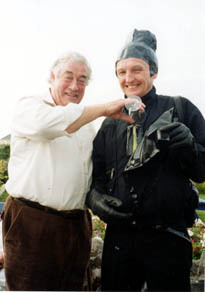 The first Redemption was held in February 1999 in Ashford, Kent and Judith and I were on the committee along with Eddie Cochrane, Chris O'Shea and Ruth Saunders. It was a Babylon 5 and Blake's 7 convention, but also covered wider SF&F stuff. It was fun, so much so that we did it again in February 2001, February 2003, February 2005, February 2007, February 2009, February 2011 and February 2013. And we are planning on doing it again in February 2015 in Coventry. The object of this page will be to show pictures taken at various SF conventions. I will also be putting up some related links, so get in touch if you want to be connected. For something a little bit, or rather a lot, different, go to arktos. This was created by maxine who also has a blog site here. The Blakes 7 Web Ring site owned by Steve Rogerson. Want to join The Blakes 7 Web Ring?